In Dhaka, the capital of Bangladesh, most journeys are made on foot, and bicycle rickshaws are the main form of vehicular transport. Rickshaws are an efficient, non-polluting way to move around, and for many people without job skills, pulling a rickshaw is the only option other than begging or crime. 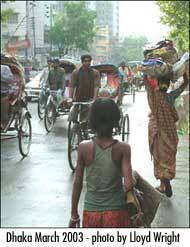 It is estimated that five million people in Bangladesh are dependent on the income of rickshaw pullers for their survival. In December 2004, under pressure from the World Bank, Dhaka City Corporation (The City of Dhaka) announced that it would ban rickshaws and non-motorised transport from an important road in Dhaka, Mirpur Road. 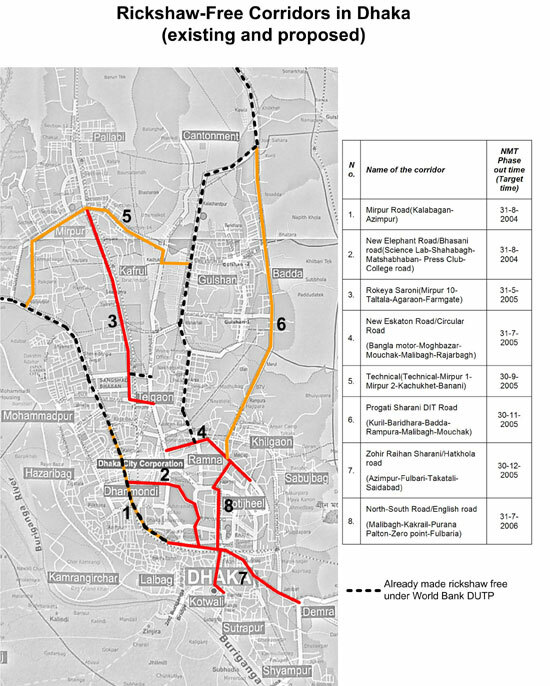 This was part of the World Bank-funded Dhaka Urban Transport Project, which has run since 1999 and is now coming to a close. At the same time, the World Bank was pressuring the Bangladeshi government to pass a law freeing the bank of legal liability for any harm that results from its policies. 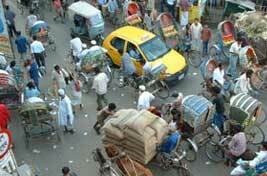 World Carfree Network joined with concerned organisations in Bangladesh and around the world to protest this action. Hundreds of people sent letters to World Bank and other officials. A formal complaint was also being filed through the World Bank's official process. As a result, the proposed ban was not implemented and the World Bank promised not to promote rickshaw bans in its development policy. Now, however, the threat is back. The city of Dhaka has again decided to blame rickshaws for congestion, apparently feeling that the needs of the 9% of motorists are more important than those of the thousands of people who use rickshaws. World Carfree Network will continue to monitor the situation. Newspaper article, New Age Metro, Dhaka, Nov. 24, 2004: "No Rickshaws from Russell Square to Azimpur by December"
Newspaper article, The Daily Star, Dhaka, Aug. 2, 2004: "Dilemma Delays Plan for Fresh Ban on Rickshaws"
World Bank document, April 1994: "Non-Motorized Transport: Confronting Poverty Through Affordable Mobility"
Dhaka Urban Transport Project (1999-2005), funded by the World Bank. The Mirpur Road rickshaw ban is a component of this project. Newspaper article, New Age Metro, Dhaka, June 25, 2004: "[World Bank] Team to Review DUTP Progress" (General incompetence delays progress on Dhaka Urban Transport Project.) Similar article in The Daily Star: "DUTP Gets More Time"